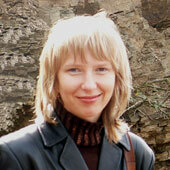 member of organizing committees of four (XIV–XVII) workshops "Therioshkola"; participant and member of organizing committee of workshop "Bats and man: natural protected and epidemiological aspects" (Puscha-Vodytsia, 2009). editor and one of authors of three volumes of the "Proceedings of Theriological School": issue 7 "Mammal fauna of Eastern Ukraine" (in memory of Olexandr Kondratenko), issue 9 "Rare theriofauna and its conservation", issue 10 "Diversity of mammals: monitoring and diagnostics". Author of two pages of this web-site: "medical mammalogy" (ukr., in chapter "library", since 2008) and "biology of underground mammals" (ukr., in chapter "our fauna", since 2010, with I. Zagorodniuk). mammal ecology, medical mammalogy, feral herd infections (incl. rabies), biology of underground rodents, rarity fauna and distribution of rare mammal species in the east of Ukraine. ecology of burrowing mammals in the east of Ukraine, census of underground mammals by their soil-excavation activity, mapping of settlements of underground mammals and their dynamics in space and time, peculiarities of biology of Donets population of northern mole-vole (Ellobius talpinus); biology and variability of mole-rats (Spalacidae). 1994 — Diploma work "Analysis of the incidence of hepatitis A in the Lutugine district of the Lugansk province", specialty "hygiene, sanitation, and epidemiology" (Stakhaniv Medical School). 2007 — Master's thesis "Ecology of feral herd infections with participation of mammals in the Luhansk province" in specialty "Ecology and environment protection" (Luhansk National Pedagogical University). 2008 — beginning of dissertation investigation "Distribution, morphological variation and ecology of mole-rat (Spalax) and vole-mole (Ellobius) in the left-bank Ukraine (postgraduate studies at the National Museum of Natural History, NASU, specialty 03-00-08 "zoology", supervisor: prof. I.G. Emelyanov). since 09.2008 still now — specialist-ecologist in Administration of the Luhansk National University. authors of 22 articles and abstracts on various aspects of ecology of mammals, including role of mammals in the functioning of natural focal infections (2005–2007), distribution, variation and ecology of burrowing mammals (2008–2010) (list of publications with links to PDF). Marina Korobchenko, P.O. Box 48, Luhansk–11, Luhansk, 91011, Ukraine.